I’m so excited. 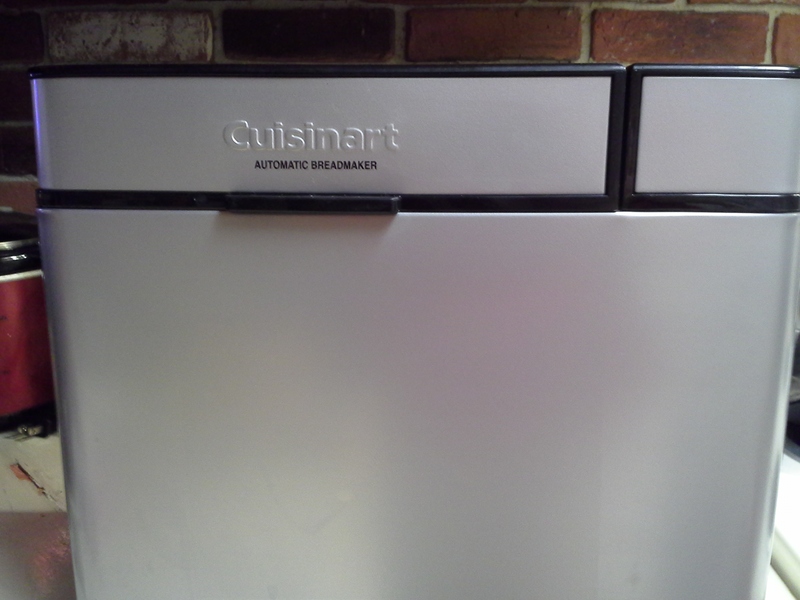 I ordered a Cuisinart bread machine last week, and it came today. It is a thing of beauty. Just see for yourself! I have been making this super easy no-knead bread that’s been going around the Internet for a while now, and it got me thinking a lot about bread and possibilities. Especially with my latest attempts at healthier eating, I did not want to carb out if I got a bread addiction, so I’ve been reading about gluten-free breads. Even picked up a copy of The Artisan Bread Machine (by Judith Fertig) at Half Priced Books. The book contains a hefty section on gluten free breads, though to be sure I also picked up a 5 lb bag of King Arthur’s bread flour. So it won’t be all gluten free or anything. That lil circle is the paddle, which it turns out you can take out after the mixing period, but I couldn’t figure it out at the time. Now I know the trick. 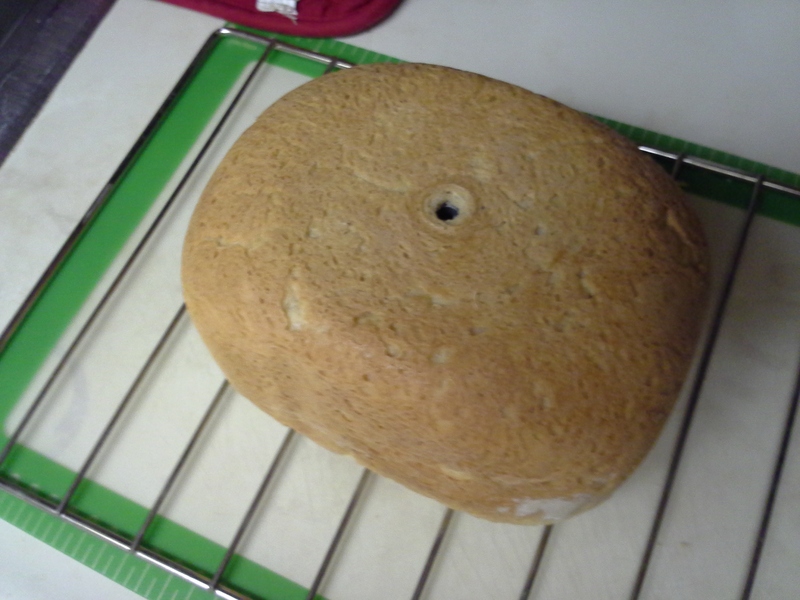 You have to release the bread pan first. So it took 2.5 hours to make this bread, and it comes in at 132 calories a slice if you cut the 2 lb loaf into 15 pieces, which you can. It has all sorts of yummy, unexpected ingredients like apple sauce and apple cider, which I happened to have on hand because I make apple dumplins all the time. I’d just invested in a bottle of Braggs Organic apple cider, too, so I could make paleo cole slaw (recipe and pics to come–that’s tomorrow). 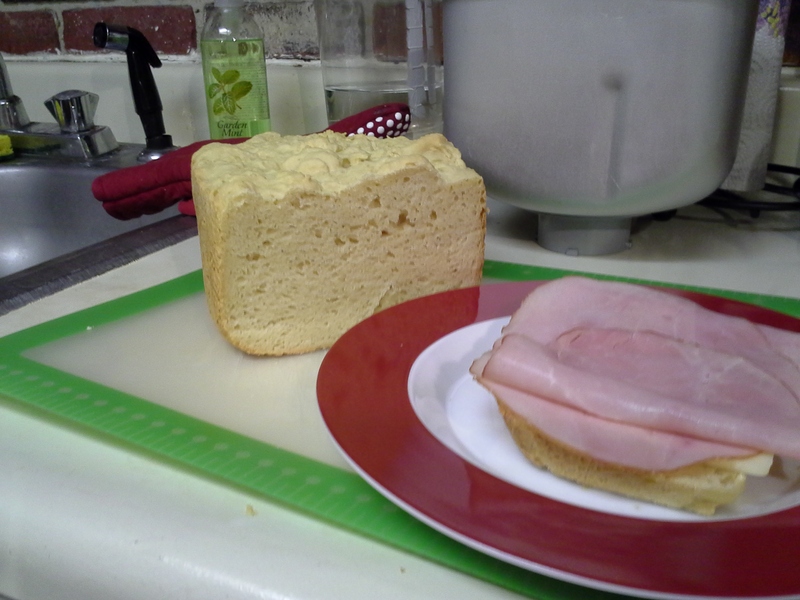 Anyway, gluten free bread with this recipe is yummy, just like white bread, but a fair amount heavier. I made an open sandwich with it to reduce the calorie consumption and because honestly, as heavy as it is, one slice is all you need. Check it out! Boar’s Head ham & swiss on a gluten free slice. Could anything be more divine? I put all the ingredients in the machine in this order, and set it for gluten free. I scraped down the sides after about 10 minutes, then walked away. That is all. So easy!